This special event is a Field Trip to the San Joaquin Valley side of Tejon Ranch Conservancy for our SLO-CNPS chapter members and friends. 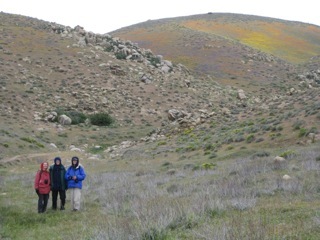 Tejon Ranch Conservancy field trip, led by Mike White, conservation science director, will host a 3 to 4 hour walk, choosing the best location to see the spring wildflower bloom within the 240,000 acres Tejon Ranch in the Tehachapi Range. Last year’s Tejon trip featured carpets of spectacular flowers. To decide if this trip is for you, please visit their website, then go to Events, 2011 Community Hike Program, and under General Information scroll down to For more information. Traveling to the Tejon Ranch: It is about a three to three 1/2 hour drive from SLO to the Tejon Ranch taking Hwy 101, Hwy 166 and Hwy I-5. Specific traveling instructions will be emailed to registered participants once the location for the best spring bloom is determined by the Tejon Ranch Conservancy leader, about a week before 3/26. To Register: Because SLO-CNPS has made special arrangements with the Tejon Ranch Conservancy all participants must register prior to this event. Limited to 25 people. Please contact Lynne Peterson, email, lynne1112@hotmail.com, or by phone, (805) 706-0301, for questions or to make your reservations. For additional information: Contact Bill Waycott (SLO CNPS’ new field trip chair) by email, bill.waycott@gmail.com, or by phone, (805) 459-2103. If you have not yet visited our Facebook page at http://www.facebook.com/CNPSSLO, please do as it shows recent photos of field trips, up to date flower locations and more. If you would like to post information, you can send it to me at dchippin@calpoly.edu. We had two excellent early April field trips to Shell Creek and then to Chimineas Ranch with George Butterworth. Even though we lacked the lush windflower carpets of last year, there was plenty to see at both locations including interesting snakes and lizards. In spite of the heavy rains of March, the rains of late 2010 combined with the extended January drought to reduce the show this year, although we hope late flowering species such as Clarkia might do well. It seems you never can tell, and that is half the fun. Where you WILL have fun is at the Santa Margarita Lake picnic on May 1, so we hope to see you there. Work has started on compiling photos of the flora of the Carrizo Plains, using the team that put together the wonderful San Luis Obispo book. If you have photos of sufficient detail of species that you suspect might be missed by the committee, please send them to me. We don’t want scenery but if you have high quality images of an interesting plant we would like to see them. Don’t be shy. CNPS testified at the first Planning Commission hearing on the Topaz Solar Plant that we would prefer the plant to be moved as far to the northwest as possible into existing ploughed fields, giving better protection to grassland areas closer to California Valley and the National Monument. We are unfortunately getting opposition from agriculturalists who wish to keep the Williamson Act-protected plough land from being converted. In the last newsletter I had asked for help from any certified herbicide applicators that could help us perform weed control in our vastly underfunded public lands. None were forthcoming, and so I will now ask for any people who might be willing to shovel, hoe and rake to protect native plants. I will be working with California State Parks as they have expressed a willingness to work with CNPS on this issue. Projects I have in mind are the protection of wildflower populations though veldt grass and long leaf ice plant control in the Butte Drive area of Montana de Oro and the Powell Addition to Morro Bay State Park. There is also cape ivy that can be raked out of the understory in Los Osos Oaks. I am sure some of you may have some other projects in mind. I will set up a field trip to take any interested people to look at these projects. Please contact me if you are interested in adopting some small patch in wildflowers and saving them for future generations. Led by Neil Havlik, Natural Resources Manager at City of SLO. This field trip for CNPS members is limited to twenty people, on a first come first served basis. This hike is 7 miles round trip and takes about 4 hours. We will meet at Foods For Less parking lot, at the corner of South Higuera and Suburban Road, near the US Bank building at 9 a.m., and then drive together to the Guidetti Ranch. We will be looking for the Indian Knob mountain balm, Eriodictyon altissimum, among other plants. Bring lunch, water, sun protection, dress in layers, and have good walking shoes. Be sure to bring your copy of Wildflowers of San Luis Obispo, California. Sign up by calling Bill Waycott at (805) 459-2103 or emailing him at: bill.waycott@gmail.com. Saturday, May 7, 9:00 a.m.
Come celebrate Mothers Day weekend with a walk through the plant communities that inhabit one of our most popular Morros, Bishop Peak. Start on the north side passing through oak woodland and grasslands with views of the city to the north, then transition to the south side passing through a diverse and attractive chaparral landscape with views of Laguna Lake and the Irish Hills. Total distance is 6 miles taking roughly 3.5 hours. Meet at the trailhead on the west side of Patricia Drive in San Luis Obispo, between Patricia Court and Anacapa Circle. We had an excellent turnout for our yearly north county meeting, and it was really great to see faces that don’t usually appear at out SLO Meetings. I would be very interested to hear from north county people on what they thought of the program, and what they would like to see next year. Our next meeting not held in the Vets Hall, but at Shell Creek (field trip information). This is always a fun outing, and it may be a bit more of an adventure as the creek is running high at the moment. I think the wildflowers will be great this year, including those along Highway 58 on the way. We are going to be present at Earth Day celebrations at the SLO Botanic Garden, so give us a visit. We are always looking for volunteers who would help our boothing regulars. happenings, which will also be mounted on our web site. CORRECTION: In the last Conservation post of the solar project that adjoins Belmont Trail and which lies closest to the Temblor Range I mistakenly named the developer as First Solar, instead of SunPower. CNPS is also commenting on First Solar’s project, which is further north and to the west. I regret to say that the Planning Commission seemed to have ignored CNPS concerns with the SunPower project’s impacts to flower fields, and approved the project by unanimous vote. We had asked that some definite conservation actions such as offsite mitigation funding be set up prior to approving the project, as the EIR assigns Class II impacts (impacts that can be mitigated) only if additional steps are taken. We have concerns that the Board of Supervisors might be equally dismissive of biological impacts on the basis of an overriding consideration that solar power and carbon reductions trump local effects. We do not have the same problems with the First Solar/ Topaz project, where impacts to flora are much less evident. In another problematic move, the City of Pismo Beach is changing the area that they are considering for annexation in the Price Canyon area, removing the Spanish Springs North Ranch property which is northwest of the highway, and adding the Godfrey Ranch which lies southwest of the Spanish Springs South Ranch, and is west of the western end of Vetter Lane. The Godfrey ranch is essentially undeveloped grasslands with scattered oaks and would appear to be prime habitat for Pismo clarkia. To develop this property, which is remote from the core of Pismo Beach, would be the epitome of urban sprawl. One would imagine that this property would also require an additional water source. Saturday, April 9, 9 a.m.
Meet at the La Purisima Mission Parking Lot, corner of Purisima and Mission Gate Roads. (2295 Purisima Road, Lompoc) at 9 a.m. for this annual spring tour of the beauties of the Burton Mesa Chaparral. Optional afternoon tour. Sturdy shoes, lunch & liquids, camera and binoculars advised. For more information, call Charlie at (805) 733-3189. Chimineas is a Dept. of Fish and Game Ecological Reserve in southeast SLO County with wonderful wilderness and wildflowers. To car caravan from SLO, meet at the Vet’s Hall (Grand at Monterey), at 8:30 am on Wednesday, April 6. At Chimineas meet at 10:00 am at the Feed Lot pull out, on the north side of Hwy 166, 33 1/4 miles east of Hwy 101, 1/4 mile east of Miranda Canyon Rd. Bring: the usual water, food, sturdy shoes, sunscreen, and clothes for the weather. This is an all day trip. Roads are dirt, a little rough but passable; trucks are good; small sedans not recommended. Rain cancels to the following Wednesday. Contact: George, (805) 438-3641, or gbutterworth8@gmail.com. The April Chapter Meeting is held at the Annual Malcolm McLeod Memorial Field Trip Meeting to Shell Creek. See Field Trips/Shell Creek for information. There is no meeting at the Vets Hall this month.